"New shirts and a Print"
For Anime Expo a few weeks ago I pulled together two new shirt designs to bring to the show - the Endgames design and the 3D Largo design, which people seemed to respond to pretty well at the show. These two designs are now available in the MegaGear store, as well as two more new shirt designs: Zom-Zom and Junpei, just to flesh out our fall back-to-school collection. The first design is from one of the sketches I did for the short story sample I worked on with Thomas Knapp called “Endgames: Behind the Masque”. It’s part of an effort to write a series of light novels covering the events in the Endgames world from within Endgames itself. You can find the e-book in the Amazon Kindle store (which does not require owning a kindle to purchase - you can read it from your PC or smart phone too). Called “Behind the Cask” it depicts a scene in the story where Largo has discovered that the inn sells it’s Black Mead in Man-Sized while Pirogoeth and M0h attempt to have a quiet glass of wine. 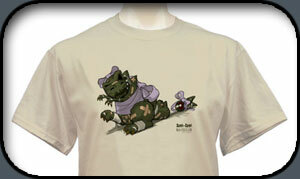 Image is colored and tinted to print on a Tan 100% pre-shrunk cotton shirt. (Note: 4XL and 5XL shirts are printed on Light Grey). Go get one. The next design comes from tinkering around with 3d Anaglyphs and a challenge from Seraphim. I seriously doubted that I could make a 3d anaglyph that worked (I tend to have trouble seeing 3D stuff) so I was more than a little surprised when I actually was able to make one that worked. I suppose that it helped that Largo is almost 3D anyways so maybe I cheated a little. The real trick was getting the Red/Cyan color balance to work on the shirts but success was achieved. Also available as a fine art print, these 3D Largo delivery devices (shirt, print) come with a pair of Red/Cyan 3D glasses. Experiences 3D Ph33r Here. I’ve been wanting to create a simple 3D Junpei shirt for a while, the only problem being I had trouble creating an image of Junpei that was awesoem enough for a t-shirt. 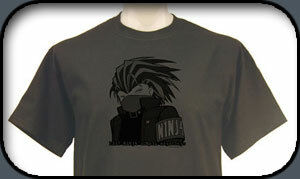 Also, there is that small problem of how do you represent an awesome Ninja on a shirt who you technically aren’t supposed to see? Junpei was nice enough to stand still long enough for me to pull this shirt together. Printed using black inks on a charcoal grey 100% preshrunk cotton shirt. (Note: 4XL and 5XL shirts are printed on Light Grey shirt which DOES make him more visible, but we asked, he’s OK with it.) Get your Junpei shirt today. Finally, here’s a shirt design that I think actually came out pretty well. I’m not good at drawing monsters, really. Drawing Rent-a-zilla was always difficult - drawing a putrescent, rotting, shrunken Chibi-Zombie-Rent-a-zilla was even more daunting. Taking heart (and some inspiration from the awesome work of Mike Mignola) I think I’ve actually managed to capture Zom-Zom as being disgusting and horrifying yet amusing and adorable in this image. You gotta feel for him. It’s not easy being a huge powerful Rent-a-zilla who has been turned into a Zombie by an intense onslaught of Zombie Ranger Hordes while helping out this really nice (if somewhat annoying) magical girl who fed him lots of Pork Rinds. Shrunk to a more manageable, indoor-pet size by one of the Magical Girl’s mom’s friends, covered in bandages, duct tape and ribbons to hold his rotting zombie flesh together, it’s all a little embarrassing. But it doesn’t mean that his awesome undead roar and his lumbering rotting carcass can’t put the fear of the living into tiny pitiful humans (even if he is smaller than they are)... now if only his tail wouldn’t keep falling off. Full color image printed on Sand 100% preshrunk cotton t-shirt. No zombies or zillas were harmed in the production of this shirt - we just taped the tail back on. (Note: 4XL and 5XL shirts are printed on Light Grey) GNRAWWW! (Go get one). Ok, that covers the new stuff in the MegaGear store. I know a lot of you are still waiting for me to finish your sketches, I’ve been trying to get through them as fast as I can, so thank you for your patience (i’m sort of doing too nice a job on them - on the whole they tend to be a lot nicer than the sketches I do at conventions, so I hope you will think the wait worthwhile). The fun thing about sketches is a lot of them are actually kinda fun. After I got back from Anime Expo I started to scan every sketch with the idea that I’d post them so that others can see what the whole range of them looks like. I’ve started posting them to my new pirorant tumblr blog which I’ll be updating with scans in batches over the next few weeks or so. Going back to pencil drawing has really been a bit of a boon for me, lately. Odd how much more creative my sketching has been (and how much faster I seem to be able to draw stuffs). The time sink on the last comic was, oddly enough, the hatching (which I have done by computer for the last few comics). This next comic I’m going to try just hatching by hand again because it can’t possibly take as long as the computer hatching did. ^^;;; (The plan is to scan the drawings before I hand-hatch so I have a clean version and a hatched final drawing when all is said and done). With luck, I might be able to have this comic up by tomorrow, which would be awesome. 2 comics per week is my goal, and maybe I can hit it this week. 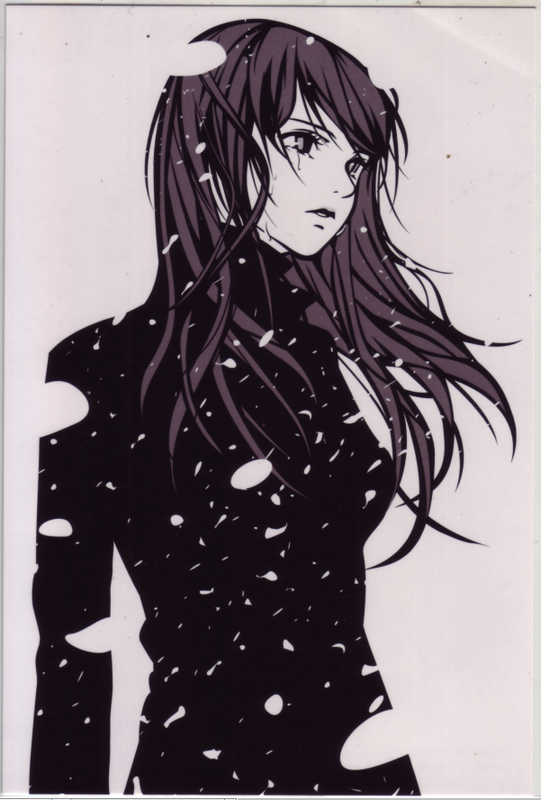 In other miscellaneous stuffs... got this nice postcard in the mail the other day with a note that said “I found this Sad Girl in Snow at EPCOT Japan and I wanted to send her to the Master of the Genre.” This drawing/image is by an artist named Eri Kamijo, who’s works really are awesome. Thank’s Roger! Speaking of artists, a came across the work of a talented young lady named Jo - I was particularly impressed by her pencil drawings in her sketchbook, like this one... man, i wish i could sketch so clean (i note she uses the same mechanical pencils i use, Pilot S5, but i only go down to .04mm). Yes, yet another artist who’d delightful work makes me feel like my fingers could lopped off and put to more useful tasks like holding doors open. :P Beautiful stuff, Jo. Hey, folks. Long time no see. So, a lot of things have happened. Have I mentioned that I moved to San Francisco? Probably not. Incidentally, this city is amazing and insane. So, new season of anime means a new group of shows to talk about. As usual, they range from excellent to truly horrific. You're going to get some of each, friend. First is Dragon Crisis. The basic setup is that you have a guy whose parents are treasure hunters. They're globe-trotting in search of magical artifacts, some of which are very powerful. The Lead Male is actually kind of pissed at his parents over this, as they're not the most attentive of parents. So when he winds up with one in his possession, he's a bit conflicted. When said item turns out to be a girl, his internal conflict gets turned up to eleven. She's cute as a button, has imprinted upon him, and happens to be a dragon. Oh, and she's being hunted by a larger, more powerful dragon. It's not a bad show. The relationship between Rose and what's-his-face is fun. The writing is kind of uninspired, but it's not intolerable. Worth watching if a shounen that doesn't involve ninjas is your thing. Next is Fractale. The world of Fractale is... interesting. It's set in the far future, at a time where reality is incredibly heavily augmented by computer systems that are universally implanted into people. Pretty much everyone lives a nomadic life, terrified of losing their freedom by settling down. Clain is an odd duck, a guy who lives alone in an actual house and spends a lot of time studying "ancient" artifacts (think current computing systems). Then a strange woman shows up, being chased. He hides her, she gives him a brooch, and she leaves. An even stranger woman pops out of his computer. It turns out that the overarching computer system that their world depends on - the Fractale system - is starting to collapse. The story of Fractale has gotten strange, but it's a very promising show so far. There's something about it that feels like an echo of a Ghibli work. Well worth watching. Freezing is... very stereotypical in a lot of ways. Futuristic Japan under attack by aliens? Check. High school students pressed into service as weapons? Check. Generic traumatic pasts for characters? Check. Tsundere lead female? Check. Generic, bland, and earnest lead male? Check. Seriously, this could be any one of a hundred or more shows. I remember when this was called "Gunparade March"... well, except for the semi-magical effects, but that's just a detail. This show isn't even visually remarkable. Drop it like a hot potato. As if Freezing wasn't enough, there's another horribly stereotypical show this season. From some of the people who worked on Macross Frontier (and decided Ranka was a compelling character) comes Infinite Stratos. Infinite Stratos is set in a world where gender politics have been neatly turned on their head. There is a small number of mecha in the world of substantial power that can only be piloted by women. And, you know, the hapless male lead. Who happens to be improbably good at everything he does (except comprehending women). From there it turns into about what you would expect from a harem/mecha hybrid. There's the Strict Older Sister, the Tsundere, two Childhood Friends (apparently a firesale a Stereotypes R Us), the Ditzy Teacher, and various generic mecha trappings. Infinite Stratos is at best a guilty pleasure. The girls waste no time establishing a state of livelock surrounding Ichika (which I've come to call "cocklock") as each attempts and fails to acquire an exclusive lock but succeeds in locking resources required by other actors. Antics ensue. Think of the exalted work of Sir Arthur Conan Doyle. The imposing intellect of Sherlock and the Watson who kept him grounded. Now imagine that Sherlock is a little blonde girl (complete with bubble pipe) and Watson is an exchange student. Instead of being set in England, it's now set in a fictional small European nation. This is Gosick. Once your vertigo settles, I can explain that this show is actually quite good. Victorique is harsh, brash, incisive, and blindingly bright, even if she likes her aura of mystery perhaps too much. She's forced to live cooped up at the top of a tower (cue Rapunzel jokes) and craves the news and stimulation that Watson (er, Kujo) brings her. Without him, she's bored out of her skull. What does she like? Mysteries, mostly. Crimes, great and small (but preferably great) and criminals against which she can test her wit and Kujo's mettle. It doesn't take long for the two to land themselves in the middle of a murder mystery, which promptly leads to a larger and more complex murder mystery. Despite how lightly I'm treating it, Gosick is really one of the better shows this season. It's well written and the interactions between Kujo and Victorique are pure genius. When I was in high school I read that play written by Marlowe in which a man sells his soul to the devil for power and pleasure. With that in mind, I come to the next show, Puella Magi Madoka Magica. In this show, two unsuspecting girls are thrown into a chaotic world where monsters prey on humanity and Puella Magi fight against them. The Puella Magi is a girl who runs the very real risk of losing her life in combat. Our Mephistopheles is a cutsey little guy named Kyubey. He even offers Madoka a wish in exchange for her sou- er, becoming a Puella Magi. Every wish seems to come with a price, and it's implied that no wish really works out the way the girls would want it to. There are even a few implications that Kyubey is not really being entirely honest with the girls. The show is actually a lot darker than it sounds. It is unquestionably one of the best shows this season, and it gets darker by the episode. Ah, Faust, be careful what bargains you strike!